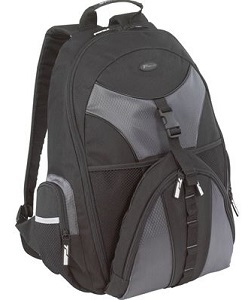 The Targus Sport Backpack is designed to fit laptops with up to 15.6” screens. The padded sleeve provides added protection when transporting your laptop inside the backpack and allows you to protect your laptop when transporting it quickly between meetings or in a suitcase while traveling. The zip-down compartment makes it easy to access multiple accessory pockets to store office supplies. The front pocket workstation includes a key clip, pen loops and pockets for a cell phone or PDA and CD player. A removable 8-slot DVD sleeve is also included for added convenience. The front buckle design allows you to transport a jacket or sweater on the backpack. This case is a cost-effective solution for a student or avid traveler. Exterior Dimensions: 12.2" x 18.1" x 5.5"
Interior Dimensions: 11" x 2.5" x 14.5"